Instead of driving around and looking for photo opportunities,I occasionally pick a spot on a back road and wait for potential subjects to come to me. This pair of buggies caught my eye because the one had the two horse setup and both were open buggies. For this particular shot,I had mounted my camera on a window mount and had it wrapped in a brown blanket to hide the camera and keep it low key.You could barely even see the lens,but the guy in the second buggy let out a loud laugh and I heard him say “there is a camera in there” as they passed. They nodded to me sitting in the truck and surely had a story to tell their friends. 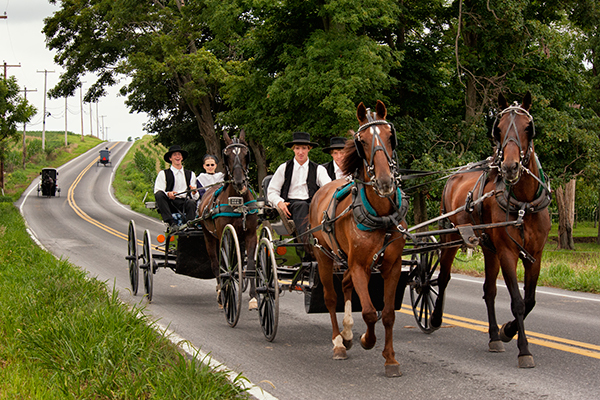 This entry was posted in Amish, Landscape, Photography and tagged Amish, Buggy, lancaster county, Landscape, Nostalgia, Photography. Bookmark the permalink. I think the horses knew it was a camera- they seem to give u the perfect pose ! Luv it..